“The game for them wasn't just a game, it was also propaganda,” says writer Vladimir Pozner about the Soviet Union's most popular sport, hockey, in Gabe Polsky's documentary RED ARMY. 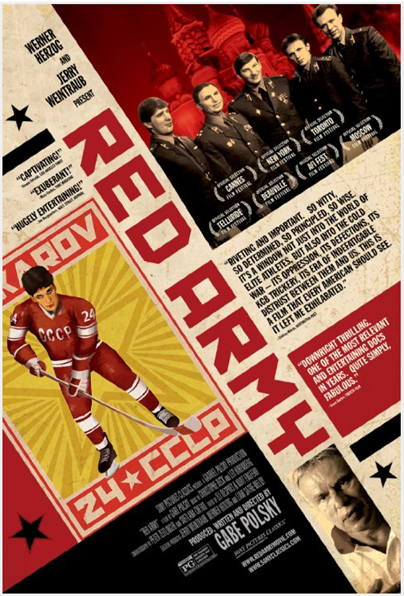 The film tells the remarkable story of the Soviet Red Army hockey team from the 1950s through the '90s, and the intersection of hockey with Cold War politics. “Sports were a kind of warfare,” Pozner says. As this film demonstrates, that is an understatement. The fascinating story of the team and its members is told largely through its many-medaled captain, Viacheslav (“Slava”) Fetisov. Slava talks about growing up in the Soviet Union in the early '60s with “no water, no toilets,” but a love for playing hockey, using empty cans for pucks. His parents found 250 rubles to buy him equipment on the black market, and soon young Slava was accepted to train at the prestigious Red Army School. The young recruits — “the best of the best” — trained intensively, and were indoctrinated in the superiority of the Soviet system. “Real men play hockey, cowards don't play hockey,” the student athletes are shown chanting, with typical Russian dourness. Soviet hockey is a thing quite different from the nasty, bashing kind practiced in the U.S and Canada — it's a graceful, balletic system that more resembles the Bolshoi than the NHL. Slava explains that this was the legacy of his mentor, Anatoli Tarasov, the team's original coach, who was considered “the father of Russian hockey.” The game Tarasov developed was creative, artistic and intricate, with much coordinated passing and weaving. The Soviet team on ice is a beautiful thing to behold. The product of collective discipline, Soviet hockey was meant to demonstrate to the world the superiority of Socialism. After a crucial loss, the Soviets replaced Tarasov with loyal Party member Viktor Tikhonov, whom the players remember with bitterness. Tikhonov was a ruthless taskmaster, so cruel he wouldn't let a player visit his dying father. The team trained under harsh conditions in isolated camps, away from their families, 11 months of the year. Slava's wife speaks vividly of the hardships. Sadistic though he was, Tarasov got results: under his stewardship, the Soviet team dominated world hockey, winning eight World Championship gold medals and Olympic gold in 1984, '88 and '92. Soviet ice hockey thrilled fans worldwide. The craze for Soviet hockey reached its apex at the 1980 Winter Olympics at Lake Placid, where the “Miracle on Ice” – deemed the 20th century's top sports moment by Sports Illustrated – saw the U.S national team defeat the USSR, which had won the gold in six of seven previous Olympic games. The victory occasioned a surge of American triumphalism at the dawn of the Reagan era. Slava eventually rebelled against Tarasov's tyranny. “Why play for a guy who doesn't respect us as humans?” He would not defect, but decided he wanted to play in the NHL and submitted a request to Soviet officials. That set off a Kafkaesque series of events – threats, promises made and then broken. The Minister of Defence ordered Slava to apologize or be sent to Siberia. Eventually, the thawing of U.S.-Soviet relations under glasnost enabled Slava and eight other Soviet players to join the NHL, as long as they agreed to continue to compete internationally for the Soviet Union. Slava was drafted by the New Jersey Devils and debuted with that team in 1989. American hockey was a shock: “a more brutal form of the game. There was no style,” he laments. He was traded to the Detroit Red Wings in 1995 and helped them to the 1995 Stanley Cup Finals, and went on to win Stanley Cups in 1997 and '98 before retiring. By 2002, he returned to Russia in 2002, where he now serves in a post created for him, Minister of Sport. Director Polsky, whose parents are from the former Soviet Union, played hockey for Yale before becoming a filmmaker. Polsky said in an interview with Jordan Adler that he watched VHS tapes of the Soviet team and thought, “'Man, that is just incredible! I want to play like that' It's just amazing what they did.” He researched the team and was fascinated by the story of the team, the politics, and the use of hockey as a propaganda tool. Polsky persuaded a reluctant Fetisov to sit for five hours of interviews (the former player shows his impatience at times, once with an extended middle finger). The resulting film, skillfully edited and enhanced by interesting footage, interviews, photographs and graphics and a good score by Christophe Beck and Leo Birenberg, is enthralling, even for the non-sports fan. 4 out of 4 stars.